Why are millions of people in the UK struggling to get out their Overdraft & become debt free? According to Stepchange 2.1 Million people across the UK were constantly in their overdraft throughout 2016, with 81% of those individuals using their overdrafts to buy food, livings costs or household bills. Why are overdrafts the most commonly known credit facility in the UK? Most individuals we speak to here at Scottish Trust Deed do not classify their overdraft as debt when gathering their information on what is owed, why is this? The most common feedback on overdrafts is that it is paid back each time that individual is paid but just like every other debt it comes at a cost & each time there is fees it reduces that individuals disposable income every time the fees are charged. Overdrafts are in place by banks and building society’s as a way of short term lending, however many individuals in Scotland are now seeing this as a way of long term lending which can become very costly. 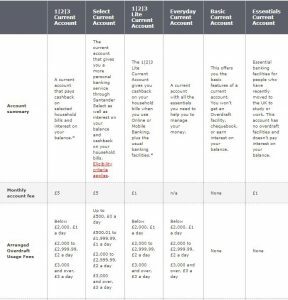 Stepchange (debt charity) have claimed in one report the average overdraft in 2016 was £1,722, so we have compared three popular banks in Scotland to see just how much they are currently charging on their overdrafts (September 2018). 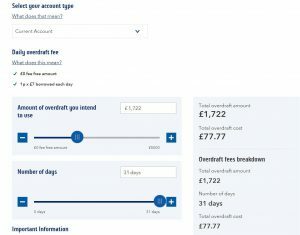 Bank of Scotland state that with a current account borrowing £1,722 within their overdraft facility each month with costs as much as £77.77 per month! 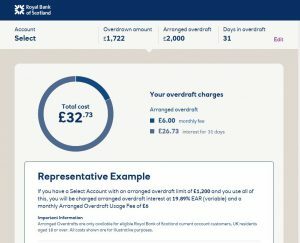 Royal Bank of Scotland state that with a select current account borrowing £1,722 within their overdraft facility each month with costs as much as £32.73 per month! Santander state that with a 1|2|3 current account borrowing £1,722 within their overdraft facility each month with costs as much as £36.00 (this includes account fee at 35 per month) per month! If you find yourself in a constant struggle with debt, why not find out if you qualify for a Scottish Protected Trust Deed? This entry was posted in Uncategorized and tagged bank of scotland overdraft fee, banks, debt free, overdraft cost, Overdrafts, royal bank of scotland overdraft fees, santander overdraft fees, scottish trust deed, struggling with debt on September 17, 2018 by Stuart Stirling.